Bangalore is reeling at Chepauk, can Parthiv Patel and bowlers bail them out? 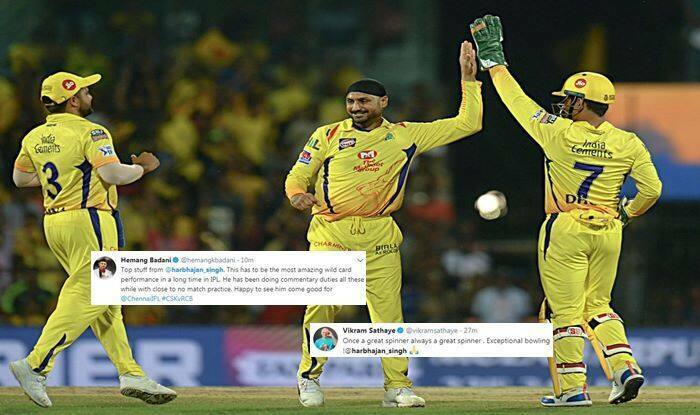 Chennai Super Kings Harbhajan Singh turned back the clock at Chepauk with a phenomenal three-wicket spell in the first game of the ongoing Indian T20 League. The 38-year-old looked sharp and was on the button as he picked up big wickets of Virat Kohli, Moeen Ali and AB de Villiers. The Punjab-born cricketer conceded 20 runs in his stipulated four overs. Harbhajan first picked up the wicket of Kohli and that was the big one. Kohli departed for six off 12 balls. Harbhajan then dismissed Ali, De Villiers for nine runs. At the time of filing the copy, Bangalore was looking down the barrel as they were 65/8 in 15 overs. Parthiv Patel is on 26 of 29 and is the lone warrior.